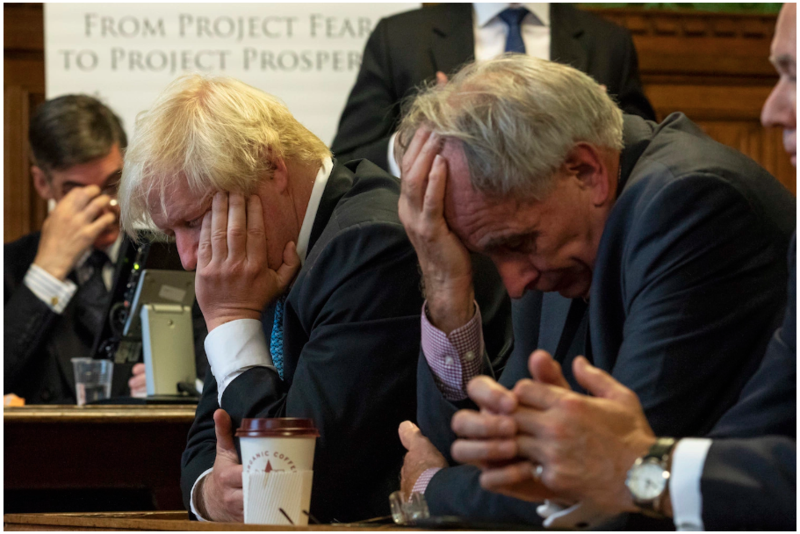 Conservative members of Parliament Jacob Rees-Mogg, Boris Johnson, and Peter Bone listen during the launch of “A World Trade Deal: The Complete Guide” at the Houses of Parliament on September 11, 2018 in London, England. Following a no-deal Brexit, frictionless trade in goods would end overnight. Everything coming into Britain would need to be checked at the border, but the country does not have the infrastructure to do this, let alone the facilities to store food safely while it is waiting to be checked. It will take years to either build such infrastructure at Dover or expand existing facilities at U.K. ports, which handle British trade with the rest of the world, all of which is subject to customs checks. The service sector would also be hit hard. For example, British-based financial firms would lose overnight their right to sell their services across the EU—their so-called passporting rights—creating legal uncertainty over contracts. British-based financial firms would lose overnight their right to sell their services across the EU—their so-called passporting rights—creating legal uncertainty over contracts. This would affect the clearing and settlement of financial trades, especially of derivatives (futures, options, and swaps), which are overwhelmingly centered in London. The Bank of England estimates that around £29 trillion (approximately $38 trillion) of derivatives contracts, including 90 percent of euro-denominated interest rate swaps, would be hit by a no-deal Brexit. and how quickly the economy would rebound. There are good reasons to believe that the rebound would be slow.The British government and the EU would agree on measures to allow the resumption of trade in things such as chemicals and pharmaceuticals, but the imposition of tariffs would be very costly. Honda estimates that tariffs would push up the cost of a U.K.-built car by 10 percent. And British exports would face EU tariffs. The biggest hit to British living standards would arguably come through the impact of no deal on investment. The United Kingdom would become a less attractive place to invest in traded goods, such as cars and other complex manufactured goods that require a lot of imported components. The United Kingdom would become a less attractive place to invest in traded goods, such as cars and other complex manufactured goods that require a lot of imported components. Lower wage costs—the result of a weaker pound—would not offset the increased costs of trade because labor costs now account for a low and falling share of total costs in high-end manufacturing. Weaker consumption, the result of higher inflation, would also hit investment. The result would be slower productivity growth and hence weaker growth in wages.A no-deal Brexit would also create huge uncertainty over the legal status of the 3 million EU citizens living in the United Kingdom. The end of free movement of labor would lead to a sharp fall in the number of people coming to work in Britain from EU counties, slowing economic growth. No deal would have immediate but much less serious consequences for the EU. On average, EU member states do about 8 percent of their trade with Britain, compared with Britain’s 44 percent with the EU. They can also relatively easily replace British suppliers with those from other member states. However, some EU member states would suffer more than others.For example, the Irish economy is closely linked with Britain’s, and much of Ireland’s trade with the EU passes through Britain. Moreover, no deal would lead to the imposition of a hard border between Northern Ireland and Ireland, putting into doubt the survival of the Good Friday Agreement of 1998, which ended decades of violence between Irish nationalists and Unionists loyal to London.